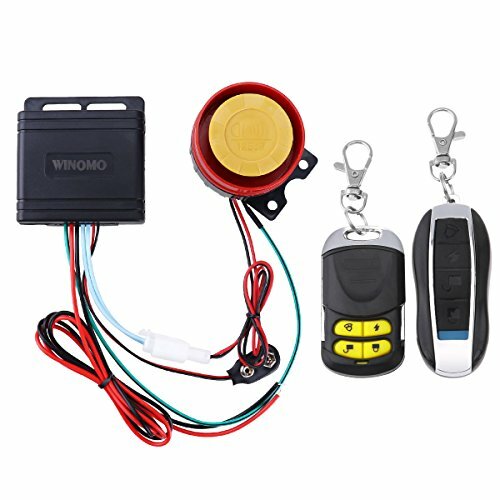 WINOMO Motorcycle Alarm System Anti Theft Security System with Double Remote Control 12v Universal by WINOMO at Nebula Fia. MPN: 10921444Y1O65276. Hurry! Limited time offer. Offer valid only while supplies last. DescriptionThis is new Motorcycle Anti-theft Alarm device, which is specially designed for your Motorcycle and protects it from steal of the thieves. This is new Motorcycle Anti-theft Alarm device, which is specially designed for your Motorcycle and protects it from steal of the thieves. This Anti-theft Alarm device is characterized by a sensitive motion sensor, a 4 buttons remote controller. - Material: Plastic and Electric componenets. - Size: Approx. 7 * 6.5 * 2.3cm/ 2.8 * 2.56 * 0.9 inch (L*W*H). - Ergonomic Design: Easy to use and install with compact and portable design. - Widely Application: Universally work with any motorcycle with 12 Volt. - Convenient to Use: Electronic Anti-theft Alarm with double remote controller.Shock Sensor with Remote Arming/Disarming. - For Security: Call for help in Emergency. Let your motorbike keep away from thieves. Ergonomic Design: Easy to use and install with compact and portable design. Widely Application: Universally work with any motorcycle with 12 Volt. Convenient to Use: Electronic Anti-theft Alarm with double remote controller. Shock Sensor with Remote Arming/Disarming. For Security: Call for help in Emergency. Let your motorbike keep away from thieves. And it will call for help in emergency to warn its owner.